STATEN ISLAND, ROCHESTER--Watkins' Gabe Planty competed at the Ocean Breeze Invitational on Staten Island, Saturday, Jan. 26. Planty finished sixth with a time of 4:26.8, a new indoor school record and an automatic state qualifying time. Meanwhile, the rest of the varsity indoor track teams competed in the Trent Jackson/Cedric Walker Invitational held at the Rochester Institute of Technology, Saturday. Kaylana Rekczis was 18th in the 1500 meter race walk (9:28.72). Jill Cantieni took 20th in the weight throw (17' 11.5", a school record). Kai Sutterby was 31st in the 1000 meter (3:37.73). Sam Thorsland placed 33rd in the 1600 meter (5:27.05). Haley Dean took 36th in the 600 meter (2:00.18). Breanna Carl finished 39th in the 1500 meter (5:59.79). Cierra Barber was 47th in the shot put (22'4"). Cal Sutterby was 57th in the 300 meter (47.76). Allison Gibson placed 53rd in the long jump (14'5.25") and competed in the 55 meter (8.31). Lawrence Majors competed in the 600 meter (1:38.39, a personal record). The Senecas' girls varsity basketball team defeated Thomas A. Edison, 58-25, Friday, Jan. 25. Taylor Kelly earned 18 points, with three rebounds and two steals. Danielle Leszyk added 17 points, five rebounds, three assists, and two steals. Adrienna Solomon netted 12 points, with six rebounds, two assists, and two steals. Kelsey Kernan earned five points, four assists, four steals, and three rebounds. Jena Slater, Kathleen Clifford, and Ali LaMoreaux all scored twice. With the win, Watkins' record is 14-1. The Watkins Glen boys varsity basketball team defeated Thomas A. Edison 55-37, Friday, Jan. 25. Isaac McIlroy's recorded 16 points and Joe Chedzoy had 13. The Watkins Glen boys varsity bowling team beat Odessa-Montour, 4-0, Friday, Jan. 25. Wyatt Brower had a 601 series. H. Nathaniel Rose followed with 598. Wrett Brower posted a 490. Alex Pesco added a 478, while Dylan Markley earned a 451. The girls tied, 2-2. Nikole VanDyke led with a 596. Hayley Cornish contributed a 487, followed by Makenzie Kellogg with a 408. Nancy Jackson earned 385. WAVERLY--Six wrestlers from the combined Odessa-Montour/Watkins Glen team placed in the finals of the Interscholastic Athletic Conference (IAC) championship, Saturday, Jan. 26. Dylan Houseknecht (285) and Collin Haag (145) both won second in their weight classes. In the championship match, Houseknecht lost to Newark Valley's Trentyn Rupert, but secured two prior wins and a bye. Haag lost to Waverly's Ethan Stotler in the championships, but also had two wins and a bye leading to the finals. Josiah Lynch (132) placed third overall. Andrew Hartford (126) and Josh Bravo (220) both finished fifth. Joshua Beckley (170) took sixth. The Odessa-Montour boys varsity swim team claimed the Class C division championship at the John Beecher Invitational for the second year in a row, Saturday, Jan. 26. Brett Walters posted personal records in the 200 (2:04.75) and 100 free (54.89). Johnny Niedermaier earned his own personal bests in the 200 IM (2:36.90) and the 100 fly (1:09.05). Caleb Thomas had personal records in the 50 free (27.85) and the 100 breaststroke (1:17.92). Justin Ruocco secured personal bests in the 100 free (1:01.53) and the 100 backstroke (1:12.25). Justin Andrews improved his times in the 200 free (2:36.41) and the 500 free (7:15.68). Noah Hollenbeck posted a personal record in the 200 free (2:37.55). "The entire team swam very well and most set new personal records in their events," said Coach Terri Brace. "This invitational is our favorite to attend. It's a high energy meet and a great pool." The Odessa-Montour boys varsity basketball team lost to Spencer-Van Etten, 56-34, Friday, Jan. 25. Preston Harris led with eight points, going 4-for-4 at the free-throw line. Jared Rumsey scored seven points. Devon Mahaney and Deshawn Johnson both netted five points. Paden Grover posted four points, while Derrick Lewis had three. Cayden Confer earned two points. The Odessa-Montour girls varsity basketball team defeated Spencer-Van Etten, Friday, Jan. 25, 49-35. Sara Gardner had a career-high 21 points. Olivia Grover recorded 11 points and 10 rebounds. Kennedey Heichel added six points and six assists. Jolynn Minnier also had six points, with eight rebounds and three assists. Alexis Saunders contributed five points. The Indians' girls varsity bowling team tied with Watkins, 2-2, while the boys lost, 4-0, Friday, Jan. 25. For the girls, Jackie Vincent had a 529 series and Jana Arias followed with a 528. Pixie Kinner earned a 437. Sara Barr bowled a 367. Taryn Hoyt added a 349. Austin Hoyt led the boys with a 448. Dominick Elliott bowled a 447, while Eric Rumsey scored a 446 series. Wes Wade posted a 297. ROCHESTER--Dundee's Matt Wood and Lily Hall competed with Watkins Glen in the Trent Jackson/Cedric Walker Invitational held at the Rochester Institute of Technology, Saturday, Jan. 26. Wood placed 14th in the 3200 (10:10.7), setting a new personal record that shaved 15 seconds off of his time. He also finished 20th in the 600 meter run (1:32.21). Hall was sixth in the triple jump (34'1.75") and 10th in the long jump (16'5.5", a personal record). Dundee's boys varsity basketball team fell to Hammondsport, Saturday, Jan. 26. The final score was 59-35. Austin Gibson posted 12 points. The Scots lost to Marcus Whitman in a home game, Friday, Jan. 25. The final score was 68-37. The Lady Scots' varsity basketball team fell to Marcus Whitman, 59-25, Thursday, Jan. 24. Hallie Knapp netted eight points, with five rebounds and five steals. Makenzie Cratsley posted seven points, nine rebounds, and five steals. Megan Sutherland earned five points and four rebounds. Mackenzie Strait had four points, while Alyssah Newell scored one. The Dundee boys and girls varsity bowling teams both beat Romulus, 4-1, Thursday, Jan. 24. With the win, the girls claim the Finger Lakes West title. For the girls, Kayla Andrews posted a 430 series. Edele Morgan followed closely with a 429. Sam Hunt earned a 381. Mercedez Roy posted a 366. Connor Muck led the boys with a 640. Hunter Murphy bowled a 603. Stephan Smith contributed a 519, while Ridge Wright had a 322. Both Dundee teams lost to Marcus Whitman, Tuesday, Jan. 22. The score of the girls was 4-1. Roy bowled a 400. Hunt and Jaedyn Brewer both posted a 371 series. Andrews added a 351, while Morgan earned a 348. The boys fell, 5-0. Muck had a 464 series, followed by Murphy with a 461. Smith added a 455. Skye Strickland contributed a 336 and Wright had a 329. WEBSTER--The Penn Yan boys varsity bowling team won the Finger Lakes East Championship, Thursday, Jan. 24. The boys faced Wayne for a regular match Jan. 24 and despite losing, 4-1, still claimed the championship. Coach Melinda Johnson explained the Mustangs' overall record was better than Wayne's and Penn Yan only needed one point to win the title. Cameron Bassage led with a 612 series. Jon Mashewske bowled a 531. Trenton Samatulski posted a 524, followed by Connor Harmon with a 518. The girls blanked Wayne, 5-0. Kari Ayers recorded a 611 series. Emilie Thomas added a 575. Brandee Ellis contributed a 446. Penn Yan's boys and girls bowling teams both defeated Romulus, 5-0, Tuesday, Jan. 22. Bassage bowled a 636 series, followed by Harmon with a 631. Samatulski posted a 563. Zach Gurba earned a 535. For the girls, Ayers had a 504. Augustine bowled a 476. 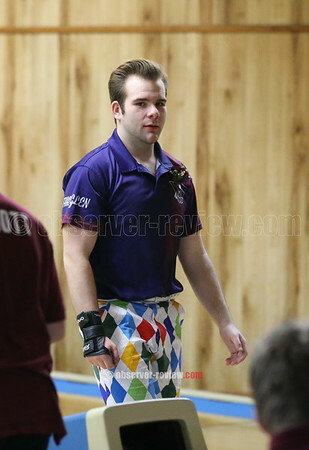 In two games, Ellis added a 309, followed by Andy Kniffen with 302. The Penn Yan boys varsity basketball team fell to Mynderse, 52-45, Friday, Jan. 25. Conner Fingar led with 11 points. Mason Kuver netted 10. Peter Nicholson posted eight points. Kyle Berna added six points, while Peyton Schuck had five points. Brennan Prather contributed three points and Colton Smith netted two. The Penn Yan girls varsity basketball team lost a close game to Mynderse, 63-61, Friday, Jan. 25. Peyton Comfort scored 17 points for the Lady Mustangs, with 10 rebounds and four assists. Ashley Sisson netted 12 points, with four rebounds. Jammie Decker added 10 points and seven rebounds. Joddie Decker followed with nine points, seven rebounds, and five assists. Jenna Curbeau scored six points, with 10 rebounds, while Sierra Harrison earned five points. Hayley Andersen rounded out the scoring with another two points. HAMMONDSPORT--The Hammondsport girls varsity basketball team defeated Lyons, 60-56, in a home game, Friday, Jan. 25. Destiny Hammond netted 21 points, with nine rebounds and three steals. Maddie Sprague earned 16 points and five rebounds. Tea Flynn followed with eight points, 12 rebounds, and five assists. Shelby Sherman scored six points, five steals, three assists, and three rebounds. Ana Salom posted five points and 11 rebounds. McKenzie Boscoe and Jillian Underhill both had two points. Hammondsport beat Friendship, 53-27, Thursday, Jan. 24. Hammond led in scoring with 18 points, as well as four assists and four rebounds. Salom posted nine points, nine rebounds, four blocks, four steals, and three assists. Rorie Whitcomb, Paula Garcia, and Sherman each had six points. Whitcomb also had eight rebounds. Flynn netted five points, with three rebounds. Boscoe added two points and four rebounds, while Underhill had one point, five assists, and four rebounds. The Hammondsport boys varsity basketball team topped Dundee, 59-35, Saturday, Jan. 26. The Scots trailed the Lakers the whole game, but outscored them by one point in the second quarter. Parker Watson scored 16 points for Hammondsport. CJ Hill added 15 points. Hammondsport topped Canisteo-Greenwood, 55-53, Wednesday, Jan. 23. The Lakers took the first quarter with a 24-11 lead. Hill led Hammondsport with 15 points. Watson followed with 14 points.